Anger is caused by our inability to mentally cope with some situation. There is a perceived loss of control over factors affecting important values. The values might be pride, getting someplace on time, someone we love, money, or being treated "fairly", etc. etc. With anger, we may hope that a burst of energy aimed at the threat will defeat it. While it is true that anger can be used constructively at times to give us energy we need to fight back if physically attacked, for most situations it merely clouds our judgement and creates extra stress. If anger prompts aggressive behavior toward other people, it can permanently harm relationships--especially with those we love. 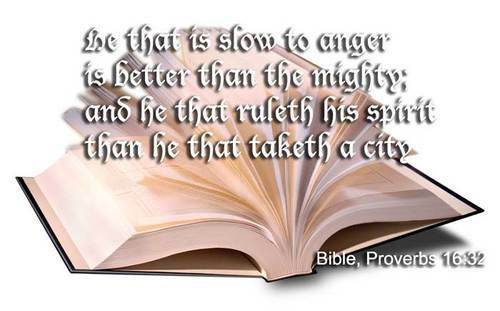 Much has been said about anger. In this post, it is my humble attempt to offer a collection of specific verses related to anger from Bhagwad Gita, the ancient Hindu Scripture. Arjuna said:— Impelled by what, does a person commit sin, much against his wishes, O Varshneya (another name of Lord Krishna), almost compelled as it were, by force? Lord Krishna said:— It is desire, it is anger, born of the mode of passion (Rajo-Guna), all devouring, most sinful; know this as the foe here (in this world). From anger comes delusion, from delusion confusion of memory; from confusion of memory the destruction of discrimination (loss of reason); from destruction of discrimination the angry person perishes. Triple is the gate of this hell, destructive of the Self—lust (desire), anger, and greed, therefore one should abandon these three. He who is able to resist the impulse arising out of desire and anger even before he quits his body—he is a Yogi, and he is a happy man. Those who are free from desire and anger, and who have subdued their minds and realised themselves—around such austere men lies the beatitude of God (Brahmic bliss).